When your life is not perfect, at least your outfit can be! That's exactly what we at Hatkay.com aims at offering you. Bringing to you the best of Indian ethnic wear fashion from across the country which are in sync with the latest trend as well define your fashionable choice. Hatkay.com is one of the most loved and most trusted ethnic wear online shopping website offering the authentic and original designs. Being a premium e-commerce store, our assortment of ethnic wear for women is unique in their designs and portrays innovative fashion. With numerous online ethnic wear stores available on the web these days, it gets really difficult for the customers to find the appropriate one. But, at Hatkay.com you can easily find your favorite designs through our various sections of bestselling designs, new arrivals and ready to ship products. Our exotic and versatile collection of ethnic outfits like sarees, salwar kameez designs, party wear gowns and lehenga will certainly make everyone go wow! As the name Hatkay.com name suggests, one will find hatkay (unique and exclusive) designs at this online shopping site. To stand out of the existing crowd, Hatkay.com believes in offering authentic and genuine ethnic attire from India and doesn’t sell any replica or duplicate designs. Indian ethnic wear market is flourishing and e-commerce players are utilizing this opportunity to the best. Apart from the strong brick and mortar presence available for this retail sector, retailers and fashion players are eyeing at strengthening their online presence as well. With technology playing a supreme power these days, maximum percentage of customers prefers having their choices delivered to their doorstep by just a few clicks, and get away with the hustle bustle of the Indian markets. For those who fall under this bracket, Hatkay.com is your one-stop fashion destination. India is known as a country with numerous states, cultures, languages, and crafts. With globalization at its peak, amazing crafts and weaves of different states are reaching every corner of the world. Likewise, Hatkay.com is an online women fashion store that pledges to get the incredible handloom, weaves, and crafts of India to their international customers across the globe. Hatkay is known for their impeccable service of shipping to USA, UK, Canada, Australia, New Zealand, and Mauritius through their impactful tie-ups with DHL, TNT, FedEx, and Aramex. Nowadays, when e-commerce is not just restricted to a web store, one can find various platforms to purchase ladies clothes and Indian clothing namely through, Facebook, Instagram and WhatsApp as well. Also, we are 24x7 available for our customers on WhatsApp. Since we know, that our customers are available worldwide, we believe in offering all-time customer service, round the clock through WhatsApp. Apart from this what makes us stand out from other online fashion sites is that in case a customer needs a before time delivery, we make sure that it is done and delivered on time without any extra payment. For us, customers are precious and our aim to have a family of happy customers with us. Customers, in today’s world eye at variety along with quality. With a line of functions and ceremonies celebrated in Indian weddings and the list of Indian festivals, one needs a plethora of options in Indian outfits to look spotlessly spectacular every time. And, nothing looks best than Indian ethnic clothes to look dazzling in each function. Festivals like Diwali, Eid, Navratri, Durga Puja, Christmas, Mother’s Day, Women’s Day, Valentine’s Day; no matter what the occasion is, every celebration calls for a shopping and our online web store offers attractive discounts and offers to make your every celebration more fun filled. Bollywood and the television industry are giving immense fashion goals to women across the world. While a few follow their favorite Bollywood star’s fashion statements while other follow daily soaps to keep themselves abreast with the latest fashion trends flaunted by their superstars. At Hatkay.com, you will find a massive collection of such trendy fashionable Indian dresses ranging from Indian suits, Indian sarees, Indian gowns and lehenga designs at lust-worthy prices. So, next time you are mesmerized by any Indian attire worn by your favorite star, you know you have to log on to Hatkay.com to find the in-trend clothing in Indian wear. Undoubtedly, Indian clothing makes every woman look stunningly gorgeous no matter which silhouette she is flaunting. With fashion designers unveiling new designs every season, it becomes mandatory to fill up the wardrobe with the latest designs available in Indian ethnic fashion. Different experimentation in cuts, colors, fabric, weaves, and silhouettes make these designer wear outfits stand out from the rest of the designs available in the market. 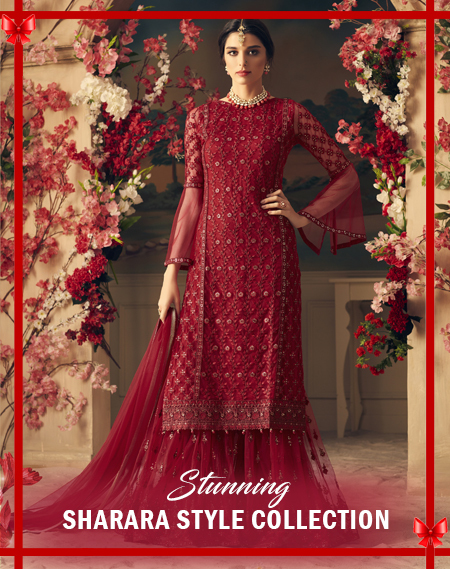 A palette of rich jewel tones accentuated with shimmering and intricate zari embroidery along with a dash of stonework pronounce ladies fashion in Indian ethnic clothing stand out from the western wear. Many times, ladies residing outside the Indian sub-continent face disappointment because of the unavailability of the designs and clothing they are looking for. As a result, they end up compromising with the price, fit and design of the outfit. To all of you; who have faced a similar problem especially during Indian festivities and weddings, fret not. Our easy and hassle-free solutions will help you keep all your fashion and clothing problems at a bay. To make your life convenient, our online fashion store also offers bespoke online tailoring. You can now shop for your favorite design and get it customized online. All you need to do is, just submit your measurements online and our team of in-house tailors will do the needful for you. They will work wonders and spell the magic on your outfits with the perfect fit. Indian wear clothing has come a long way. This evolution has resulted in the flourishing of this clothing segment. We aim at offering the most exclusive and finest collection of Indian wear in a myriad of designs and color. Crafted of the exquisite fabrics and portraying a color story of a bright palette, each piece available online at our fashion store gas a story to tell. The popularity of Indian attire has increased by leaps and bounds in past one decade. Going beyond borders, even our Hollywood actresses and style icons are known to have developed a fascination for the Indian ethnic clothing. From Beyonce, Oprah Winfrey, Naomi Campbell and more have flaunted the gorgeous attires from this land of various cultures. Saree or sari, the term is an epitome of grace and beauty. It enhances the prettiness of a woman, irrespective of the culture, caste, country or age. This piece of clothing has seen immense evolution through the decades. From a simple nine yards clothing wrapped around to being a glamorous metamorphosis of a sari gown, Indian saree has gone through a big makeover. Earlier sarees were woven in only one fabric – cotton. But now, Indian fashion designers have experimented with a variety of fabrics ranging from cotton, silk, velvet, georgette, chiffon and even linen. Online shopping websites are flooded with numerous ethnic saree designs. One can find a plethora of trending silhouettes in designer saree in different price buckets. Eminent fashion designers have unveiled gorgeous sari designs which have enthralled women of all age groups. Earlier sarees were primarily worn by elder women and in many states of India, it was referred as an official garment to be worn only after marriage. But with changing times and introduction of new design patterns, women of all age group are regaining an allure to flaunt this gorgeous attire at different occasions. So, whether you wish to get yourself draped in a cotton sari to your work or it is about dressing up in a lehenga style saree for your best friend’s wedding, this Indian attire looks effortlessly stylish no matter what’s the occasion or ceremony. In the present scenario, one can find beautifully woven handloom sarees available at affordable prices at different online fashion stores. This has also resulted in gaining the popularity of this garment, even among the younger generation. Ever changing saree trends like pairing up a saree with a contrasting blouse, tassel pallu sarees, neon digital print sarees are making a way for the Indian sari to occupy the precious space in every woman’s closet. Apart from the timeless range of Baluchari saree, Kantha silk saree or Jamdani sari from West Bengal, Kanjeevaram saree from Tamil Nadu, Pune’s Pathani saree or Rajasthan’s colorful Bandhani sari, women now have endless choices to choose from. So, let’s breathe in a fresh air of trend in your wardrobe with the versatile assortment of Indian saree designs available at Hatkay.com. From a line of cotton sarees, bridal sarees, wedding sarees, designer sarees, to lehenga style sarees and saree gowns, you can find endless selections to choose from. You will be spoilt for choices. If you are one of those who feels draping saree is a hassle, but still aims at stealing the spotlight at the next ceremony, then Salwar kameez undoubtedly becomes your go-to attire in Indian ethnic wear. Each and every piece of garment that combines together and defines a salwar suit has undergone a stylish transformation. From numerous style options like Palazzo suit, Churidar suit, Anarkali Suit, designer Pakistani salwar kameez, Punjabi suit and Angarakha style suit, one can now buy salwar kameez designs online from Hatkay.com and it will be delivered to the desired destination, anywhere in the world. Our collection of partywear suits, designer suits and salwar suits for the wedding party is an absolute hit! The exquisite embellishments, rich embroidery work and the captivating medley of colors accentuate the beauty of these Indian salwar kameez designs. Among the elegant styles of ethnic suits, the grandeur of Anarkali churidar suit stands out from the rest. Rich embroidered yoke and beautiful prints around the flare and hem enhance the opulence of this Indian dress. Fashion comes and goes, but style stays forever. As per the latest trends, bright and vibrant colors are going to stay for the coming season. In spite, the winter greys are ready to engulf the wardrobe, but still, you can’t skip the happy palette of pinks, reds, peach and mint green. A closet filled with a melange of such colors will certainly cheer up your mood for every occasions and celebration. Long kurta sets paired with palazzo and shararas, kurtas teamed up with long skirts, and Anarkali kurtas dressed up with palazzos are some of the very few design inspirations eminent fashion designers and Bollywood icons have portrayed this season. Follow these trends to be a spotlight stealer. Have you ever purchased lehenga choli online from a web store? If not, you must browse through our collection of the latest lehenga designs online. Trendy lehenga choli styles and designer lehenga style saree patterns will surely win your heart. Among our entire collection of designer dresses online, the collection of Indian lehenga is the most loved one. Be it is your friend’s Mehendi ceremony or your sister’s wedding, don’t forget to explore the assortment of ethnic lehengas at Hatkay including wedding lehengas, bridal lehengas, and traditional lehenga designs. Navratri is one of the most popular festivals of India celebrated with great pomp and splendor; therefore one certainly needs to have a set of chaniya choli and ghagra choli in their wardrobe. Every woman’s closet is incomplete with these classic pieces of garments. To boost your ultra-feminine side, experiment with sheer fabrics like georgette, chiffon, and net. 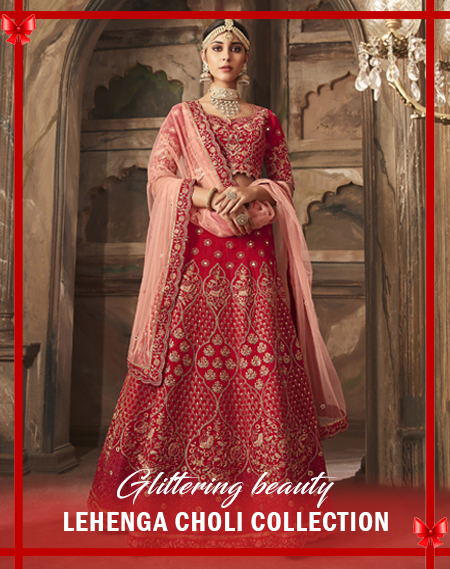 But, if you are one to follow the latest trends, pick up a lehenga design crafted in the rich fabric of Benarasi brocade and team it up with a net dupatta. You are all set to put the stage on fire! Indian weddings are all about embracing tradition with a dash of luxury and grandeur. And to make this day remarkable brides aim to look their best. Coming out of the age when sarees and lehengas were only considered the options for wedding wear dresses; nowadays brides are often seen experimenting with different silhouettes. The latest trend in ethnic dresses which has picked up admiration is the wedding gowns. Borrowing inspiration from the western attire, evening gowns, designers have unveiled this stunning silhouette which is beautifully embraced by women for their wedding ceremonies. Looking for evening gown dresses online? Look no further because Hatkay.com showcases the best selection of Indian gowns online.